I have several desktop hard drives that I need to get data to a PC. How does your product provide the power to the desktop drive, (Western Digital 102AA)? 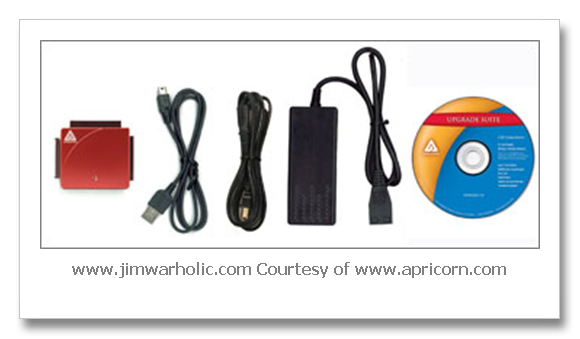 The Apricorn DriveWire adapter is a simple plug and play device. It includes both the main communications adapter assembly, USB plug, backup software, and AC power adapter. 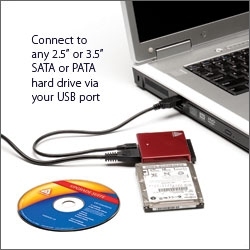 If you have old desktop computer hard drives in your hands (removed from the old desktop computers) you simply plug in the old desktop drive to the adapter (PATA IDE or SATA), and then plug in the external power supply (supplied with the DriveWire hard drive adapter kit) directly into the hard drive power connector plug for PATA IDE drives. The other end of the power supply adapter gets plugged into an AC outlet which powers the hard drive. If you are using a small serial or parallel 2.5 inch laptop/notebook HD drives, the power adapter gets plugged into the DriveWire signal communications HD connector adapter pictured at the top, and the other end still plugs into the AC outlet to provide power for the HD. As a reminder, only plug in one hard drive at a time to the HD adapter, serial or parallel, and the other end gets plugged into a USB port of any computer capable of plugging in a USB device. The USB port is how you get the information from the HD by reading the old desktop or notebook hard drives or, you can write to a desktop hard drive, transferring information to it or upgrading to a larger or new notebook/laptop or desktop hard drive using the adapter too. Once again, it works with both USB 2.0 or USB 1.1, so even if you have an older computer with the USB 1.1 or have upgraded to USB 2.0, the Apricorn DriveWire will interface to both types of USB computer connections with no problems. All of these features added up, make for a very powerful tool for all types of computer systems. With complete backward compatibility with old PCs and Apple computers alike. I take it with me when I know I am going to be working on computers for family and friends. It sure has come in handy to recover old data off a dead computer. I’M assuming you won’t be able to retrieve data off a dead hard drive. Jim,my 4 year old iMac 20 inch G5 has died and I have no back-up(I know,I know! ).I plan on buying a new G5 and I'm wondering if this Apricorn adapter will work to retrieve all my files and folders(music & pictures)off the old hard drive,and get them on the new Mac? BTW,I've purchased capacitors from you and successfully repaired a friends G5 with with help from this site,so thanks for all your help. Yep, I know how that goes with no backups to begin with. I've been there. To answer your question, "I'm wondering if this Apricorn adapter will work to retrieve all my files and folders (music & pictures) off the old hard drive, and get them on the new Mac?" Yes it will work for the old Mac to the new Mac. Simply remove the hard drive from inside the old Mac, and plug in the adapter to the back end of this old hard drive. Place the hard drive on a insulated, non-conductive surface, plug one end of the USB plug to the adapter, and the other end of the USB connector to the new Apple Mac computer, and low and behold it shows up on your Apple desktop. You can copy all files and folders (music & pictures) from the old drive to the new drive inside your new Apple computer. It is really easy to do. Once you are done, you can remove the external hard drive. You can even make the external hard drive into a backup device if you wish to also do that. The adapter is a very hand tool to use whenever you are working on any computer, to recover all types of data. It's a file life saver. Jim,one more quick question,will this work like an archive & install,where all settings like Safari bookmarks and the like are saved? This HD adapter works as though it is another HD on your Apple desktop. You would have to find out where those bookmarks are saved on the old HD, and copy them over to the new hard drive location of where the program such as Safari stores them, and save them there. Or, it is possible to navigate to the old HD applications folder, and launch the old application to export the old bookmarks. The Apricorn universal hard drive adapter comes with software for both the Mac and the PC to clone and backup a disk too. The software for the Mac is called SuperDuper! My iMac G5 will not boot up and I have tracked it down to either a bad hard drive or a bad disk controller. The disk utility from the install disk can't see the hard drive. Could I use this adapter to check if the hard drive was still viable? I don't have access to another Mac but could I hook up the drive through the adapter to a PC to just see if it was alive? You can use the adapter for drives on a PC that are formated in either FAT16, FAT32, NTFS, and probably others. However, the MAC OS HD is formated in MAC OS Extended (Journaled) mode, and will display on another MAC as an external hard drive, but does not appear on my PC desktop when I tested one out. Now, that isn't to say that you can't reformat the HD from a MAC, and use it in a PC, but I do believe there are some limitations on the crossover from simply plugging in a Extended (Journaled) HD into a PC, and reading the files, because of the Microsoft OS software. Actually I just did some research and found a reference to a program that you can download on your PC that reads the Mac disks. "Search for a program called 'MacDrive'. It works quite nicely." If the program works like it says, then maybe you can read an external Apple HD on a PC. There may be other programs out there too. I have a Nov. 2004 IMAC G5 20" Won't start up – doens' get pass the gray screen. Before trying to replace the capacitors I want to make a more recent backup. Does the hard drive need to be taken out before using the adapter? If yes, any instructions/pictures on removing the hard drive? On an an Apple iMac, simply remove the hard drive from the inside of the computer and plug it in to the adapter. As a reminder, on an iMac there is a heat sensor on the side of the hard drive that you need to unplug before removing the hard drive. It is a small plug that plugs into the sensor and the MOB. The hard drive mounting adapter can remain attached to the HD. The hard drive will show up on another Apple computer as an external HD on the desktop. I switched from a PC to a MAC. Can I transfer pictures from my PC to my MAC using this device? Yes, you can transfer pictures and other documents from a PC Hard Drive to the new or old Mac with the Apricorn Universal Hard Drive Adapter. I confirmed this myself with a drive that was removed from a PC computer, and plugged it into the hard drive adapter, and then plugged the other end of the adapter cable, which is USB 2.0 or 1.1 capable, into the USB port on a Mac, and the drive automatically shows up on the Mac desktop. Once the hard drive is on the Mac desktop, you can navigate to each of the folders and copy files and pictures to the Mac hard drive. Once everything is copied, then you can eject the external hard drive off the Mac desktop, and unplug the hard drive from the USB port. Note, that this device is for converting those internal hard drives to be an external hard drive using the hard drive adapter. You would have to remove the hard drive from the PC and set it on the desk with the adapter plugged in, or just remove the IDE or SATA cable on the PC to the HD, then attach the Apricorn Hard Drive adapter to the HD and use a USB extension cable on the output of the hard drive adapter from the PC to the Mac. Or, you could have the PC and the Mac close together so the USB cable would reach from the adapter to the Mac. I wanted to ask you how to proceed here. I bought a brand new Apple Imac G5 with ISight 17" monitor version, in 2005 I think, it was Christmas, so going into the next year, fresh start. My Imac G5 is the PowerPC version, there was no mention of Intel when I bought this. ABout 2 weeks after I bought this, suddenly there was the Intel Imac G5 with ISight, for hardly any price difference. I asked about switching, and why I wasn't told, but to no avail. I was told mine was actually better, being a true solid Apple Mac. Anyway, just this week, I went into room to use the computer, and it was a dark screen, but making weird sounds, like clicking. I Rebooted, by unplugging it, because there was no other way. It made that initial musical note, and I thought it was gonna boot up. Wrong. It made the clicks, went from a Black screen, to a greyish screen, then sudenly right in middle of screen, I got a Toggling File Folder Icon, with Finder Image, and then a Question Mark, and this continually toggled back and forth. Then the Fan came on very loudly, and fast, then screen went black again, and it seems to shut down eventually. I tried removing all cables, and power, etc,,, for lengths of time. But this keeps on happening. I tried hitting certain Keys of the Keyboard, and still, the toggling File Folder/Question Mark appears. Im not sure what is wrong. Some have suggested the Harddrive has failed, and died. I dont know. Before making a hard drive purchase, I would want to see inside the back of the iMac and check the capacitors onboard the logic card and inside the power supply unit. If either of those two items are problematic, then it could very well cause the issue you are facing. I suggest reading the various iMac G5 repair articles I have written, specifically about the logic cards and the power supplies. If after determining that the MOB and the PSU are OK, then I would turn my attention to the hard drive. To install a new drive requires the original restore software disks or a newer version of Mac OS X Leopard. Note that the newest software as of this posting from Apple, Mac OS X Snow Leopard, will not load or run on PowerPC iMac G5s. Hi I have a alienware aurora laptop which has died a death, will this adaptor work on the hard drive from this laptop? The adapter will work on any hard drive, even the small hard drives from inside laptops. Simply remove the drive from the laptop, and plug it in to the adapter, and then plug the other end into a USB port on another computer. Then you will be able to view and copy files from the old hard drive onto the new computer. Now keep in mind, recovering information from the old hard drive is assuming the hard drive is still good. If you need to do a hard drive recovery, on a damaged hard drive, then that is a different story all together. Much more can be said about that. I have a Western Digital external hard drive and the end you plug in from computer to hard drive has broken off on the HD mother board. Will this gadget allow me to connect on the huge pin thing to recover all my hard drive info? How much does it coast and where in Australia can i buy it from? If the connector is intact on the HD itself, you will be able to plug it in. If the connector is broken on the HD electronics board, you would have to have that fixed before the adapter could be plugged in. If the connector is broken on the external box that the HD is mounted in, then simply remove the HD from the external box and plug it in to the adapter. It is unclear from your questions as to which end and what connector is really broken. Note that most external hard drives that I am aware of, have an internal HD mounted inside a self contained box that is set up with a USB or FireWire adapter connector on the external box itself. If that connector is broken on the external box housing, then you could essentially bypass the external plug and use the adapter to plug in directly to the HD main connector plug. As far as shipping to Australia, I am sure Amazon will ship it there. I think these connectors are different. I think you would probably require an additional adapter. For example, you could use the following: AMP USB to 40-pin PATA ZIF IDE Adapter — ZIF SSD Drive Cloning Tool or the ZIF CE 1.8 Micro Drive to 3.5 IDE 40 Pin Adapter. Bought Apple I Mac G5 new in 2005. Started having issues took to genius bar & was told it has capacitor problems. Brought home pulled back cover & just as your sight showed capacitors on MOB are bulging & leaking. Went back to purchase the latest I Mac just a week ago & was told that the old Mac hard drive had failed & not able to transfer data? When I purchased the new one they said even though old one would not boot up they could remove hard drive & install in another computer & transfer data. But now that they said the hard drive failed could not do transfer? They refunded the $100.00 one on one transfer fee. I have many pictures & did not back up. I have viewed your sight & removed the PSU & the capacitors look good just the MOB has bad capacitors. Will this Apricorn Drivewire enable me to retrieve the pictures? Should I even try to replace the MOB capacitors? The new I Mac works great using it now, Just need to retrieve my family photos. Looking for options can you help me? Thanks,I appreciate your sight very helpful. First off, yes the Apricorn Drivewire adapter will work to get the information off your hard drive assuming that the files are not completely corrupted. I would say, there is a reasonably good chance your HD could still be able to read the files, even if you can not boot from it. However, if the HD is physically bad on the inside, the adapter will not work miracles. Many times, the HD will fail due to fluctuating voltages due to bad capacitors in the PSU and/or on the MOB. I have seen many iMacs that have the capacitor problem which was ongoing for an owner, though they might not have recognized it as such, and then the HD and/or the operating system gets corrupted. Once the HD is removed from the system, and plugged in using the adapter, the files could then be transferred. The only way to know for sure is try it and see. I have to say, my adapter has come in handy for a number of drives over the years. Thanks it kinda worked I loaded 10,400 photos & videos but now in the new iphoto some showed up but most are grey dotted boxes that when you click on just give triangle with exclamation mark! The videos show camera & time of video but click on & you get movie contains invalid data reference? It appears the older & newer Iphoto are not compatible? I spoke with Apple & they said I was 4 days past the 90 day period since i did not purchase apple care? They think it may be software issue? Actually they are not much help unless you want to pay for everything? Have you heard of this problem before & have any suggestions? I admit I’m bit of a novice on computers. I now have a back up hard drive. I have an external hard drive that is no longer recognized when I connect it to my computer. Will this adapter work for me to transfer data to another storage area? If an external hard drive is not recognized by the computer, the adapter will probably not help you there. The adapter is mainly used with a bare drive. An external drive is essentially a internal hard drive inside a case with a USB adapter built in to it. In your particular case, from what you said about the external hard drive not being recognized, there are two areas that could be faulty. One, the hard drive itself could be damaged (in my mind, most likely), or the electronics interface inside the case is defective (less likely). Additionally, you could have a problem with your computer itself (either software or hardware) that is preventing the external hard drive from being recognized. A quick way to verify that, is take the external hard drive to another computer and plug it in to see if it will recognize the hard drive there. Can the Universal Hard Drive Adapter be used to access data from any of the hard drives of any G3, G4, or G5 Mac computer? How about accessing the data from hard drives of the older Power PC computers, model 7200 series, previous to the G3 Macs? Will the adapter work with the hard drives from these older machines? I have a couple of dead computers just lying around here that I would like to get the information off of before I sell or dispose of them, Thanks for your help. 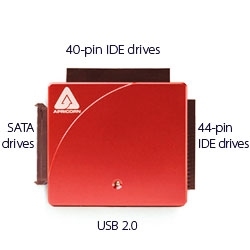 The adapter can be used for an IDE parallel PATA or Serial ATA SATA drives. I believe that the earlier Apple PowerPC 7000 series computers had SCSI interfaces. This adapter will not work on SCSI drives.